It’s been years since I hit up Lobo on 5th Avenue (that picture-poor post here), and when I heard there was a Court street location (just a 2 minute walk from the F train), I made plans to meet up with a friend who’d recently moved back to NYC. I got there a little early and started with the regular house margarita—pleasingly tart, just a hint of sweet, and just an all-around great drink. The bartender, Jenell, was welcoming and greeted me as warmly as he did all the regulars who came in the restaurant (and there were a lot of regulars). 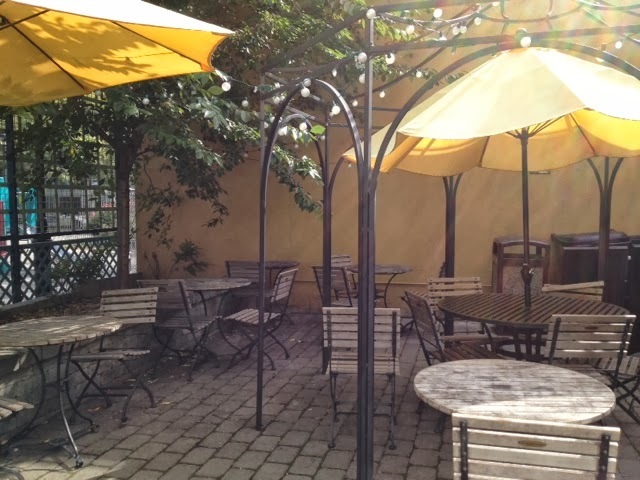 Even people walking by the restaurant would wave hello, making this spot feeling amazingly homey. My favorite rita at Lobo is still the Sangre de Lobo (wolf's blood), made with cinnamon-infused tequila. This smells and tastes amazing. The cinnamon gives it a sweetness without a ton of sugar. This is absolutely one of my favorite margaritas in the world. La margarita mas favorito del mundo! The menu is a sea of delicious options—from Tex-Mex to southern fried steak to brunchier options. I decided to try the chicken chimichanga—and you’d better be hungry if you order this! You get TWO very decent-sized chimichangas. The chicken is delicious, it’s not overly seasoned, and the salad that comes on the side (and takes up half the plate) is fresh, crunchy, garlicky, and the perfect balance to the heavier, but so-satisfying, chicken dish). It's not greasy-heavy-- it's fried, yes, but surprisingly light, but it will fill you up, which is great if you're also a fan of their delicious margaritas! My friend "II" ordered the shrimp & steak fajitas. She asked for no sour cream and no guacamole (2 of my favorite things!) and they happily accommodated her. She seemed to enjoy the food, too, and though she is not a margarita fan, they made her a virgin 'rita to enjoy as well. She was not expecting to like it that much-- there's still a lower expectation for Tex-Mex food in NYC, especially when you've lived anywhere that's known for it (as she & I both have)! She's happy to join me in another visit here! There are plenty of places to get a good margarita, and a decent number of great ones. But it's extremely rare to visit a place that so easily makes you feel like you're a regular on your very first trip. It's just staffed by nice people who are happy to see you, and I was impressed with how much that makes them stand out from the crowd. This is NYC, baby, and there are so many options that you'd never need to go to the same place twice. Thanks to the great service at Lobo, we'll visit a third, fourth, fifth, and fiftieth time! 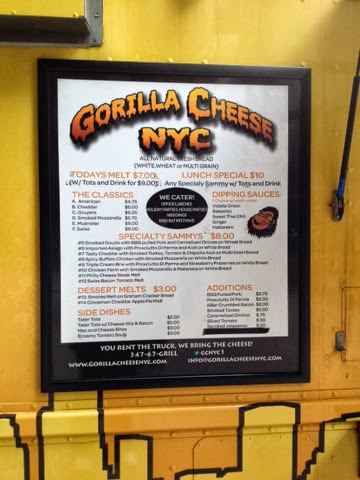 I'd seen the Mr. Nice Guy truck before, but it wasn't until this week that I stopped long enough to read the menu. Sliders? Yes! I'm in! Mr. Nice Guy has several different types of sliders, and you can get a combo box (3 sliders and fries) for 10 bucks. I ordered the Classic Nice Guy, the Bacon Cheeseburger, and the Chimi. They were all delicious. I was impressed at how tender and flavorful the meat was. These are not overcooked, bland patties. They really stood out as delicious, filling, and nicely seasoned sliders. The Nice Guy was by far and above my favorite--their house blend sauce has a heavy does of cumin, which I love. The fries were good, also well seasoned, and a generous portion, too. 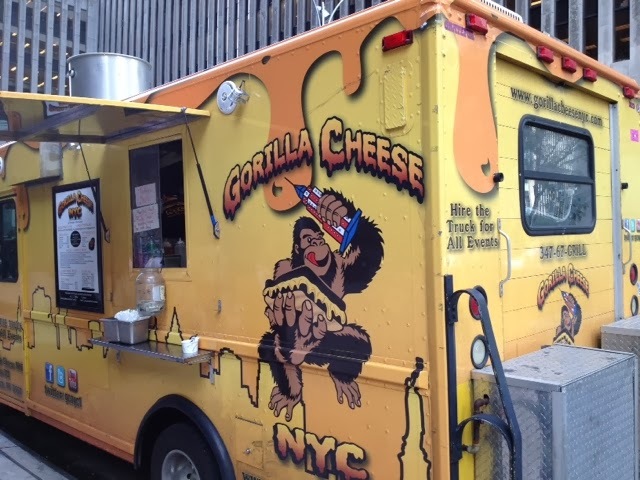 You can find where the truck will be each day by following them on Twitter @MrNiceGuyTruck. I was quite impressed with how tasty and well-prepared these burgers are! Check them out, and enjoy! 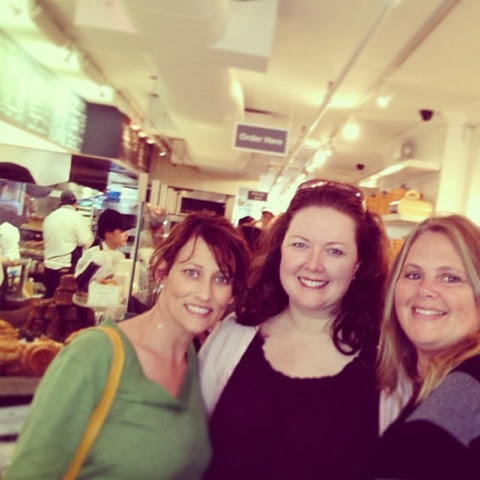 I had some friends visiting in town this weekend, and despite racking my brain for the best and most interesting things to do, they are the ones who suggested visiting Dominique Ansel's famous bakery. Of course! How could I forget such a brilliant, tasty idea? 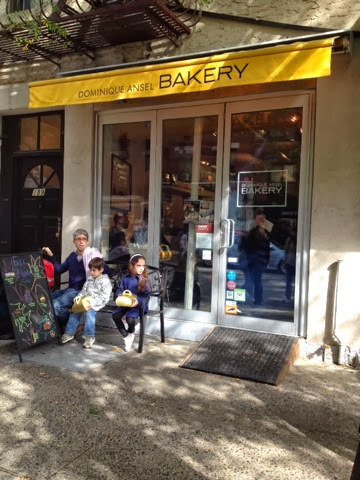 Yes, this is the birthplace of the Cronut, but my friends actually weren't that interested in the cronut after all. I already had a taste of two so far, and that was good enough for me. I'd much rather get my hands on another DKA than stand in line on a glorious Sunday morning! 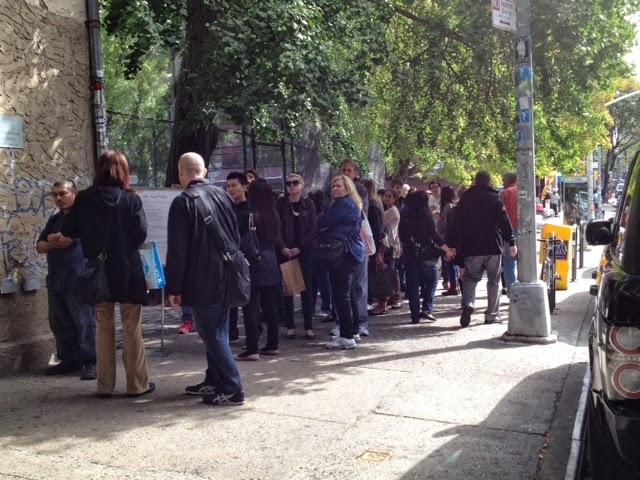 It's a tight squeeze in the bakery, as the lines for regular pastries and for the Cronuts are in two separate places. 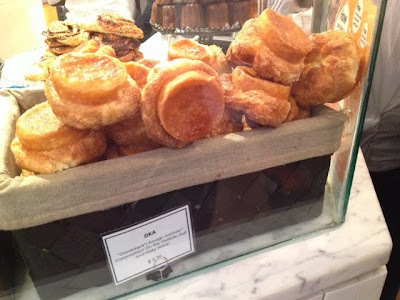 You only have a few minutes to compose your sugary thoughts, and I came loaded for bear. Or at least a lot of carbs. I picked up a DKA for me, one for ABF, a canele, a magic soufflé, and why not a frozen Smore as well? Sugar overload, anyone? A piping hot café au lait was the final touch, and the 3 of us gals picked a table in the back garden, a lovely seating area with tables (there's also indoor seating in the back as well). 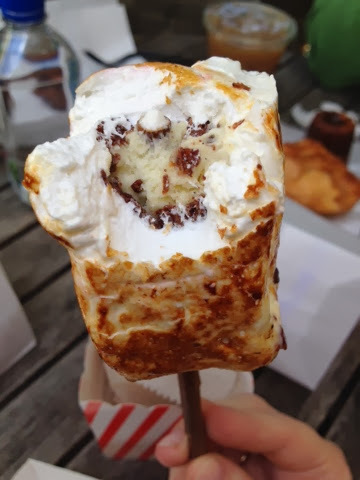 started with the Frozen S'More. 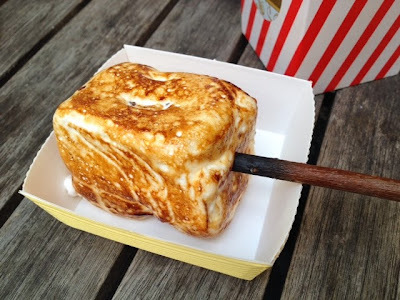 The marshmallow is a thing of beauty, gorgeous texture, velvety vanilla flavor.. but the frozen middle wasn't my favorite thing. 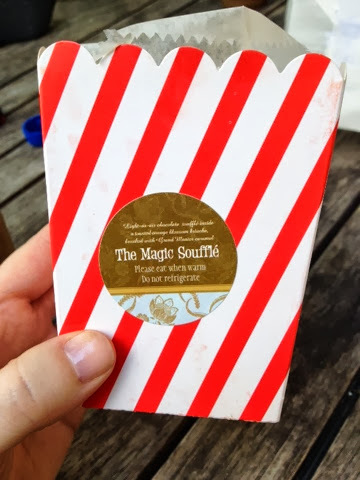 I could have eaten ten of these marshmallows, but one is a good start. 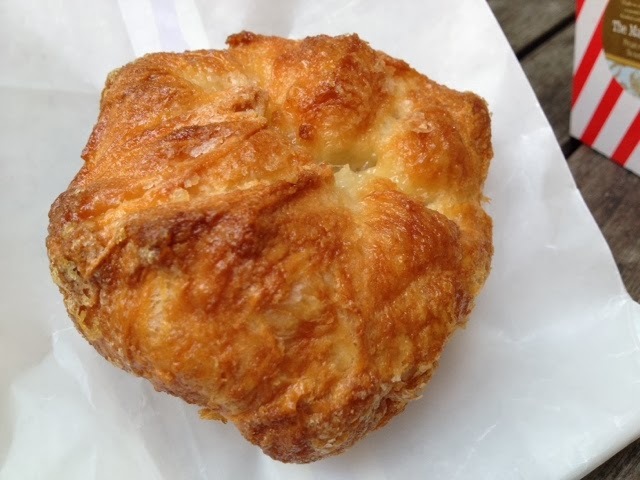 The DKA, or Dominique's Kouign Amman (a Breton specialty), was sublime as always. 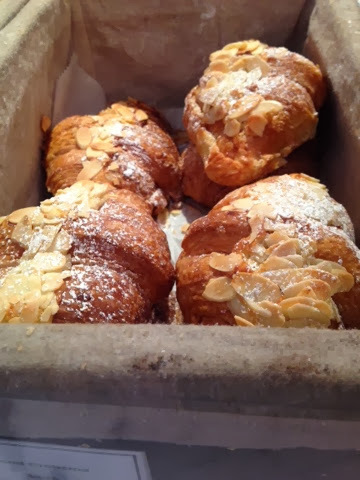 I honestly could walk away with just a DKA and a steaming cup of coffee and be in tastebud heaven. My two friends also agreed that this was tasty, though I'm not sure if they loved it as much as I did. 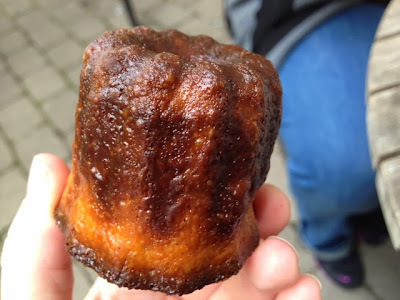 I tried a bite of the canele, one of the very first DA treats I've ever had. This was good, but a little too well-done on the outside. Back to another bite of the DKA! Next up, I sliced into the magic soufflé. The outside tastes exactly like the orange-cardomom bread my mother used to make. Exactly. It was jarring to taste something so familiar. The texture of the bread wasn't what I expected, so I wasn't that big a fan of the two flavors/textures at first. 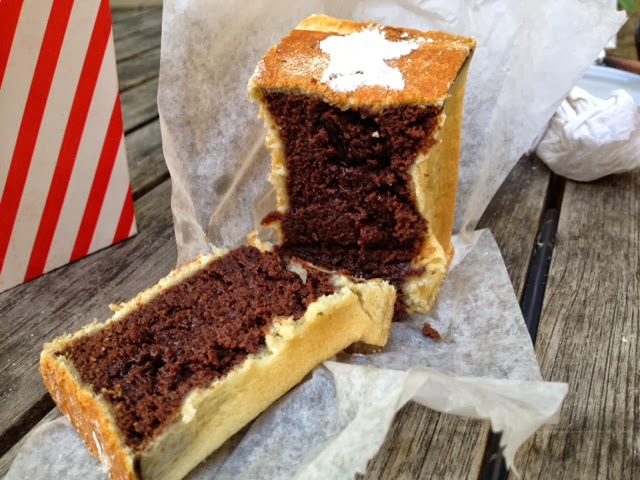 The chocolate innards were rich and delicious, but I couldn't reconcile it with the outside coating. 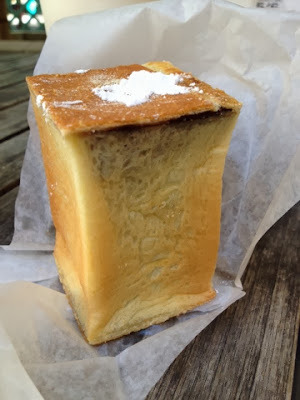 While the standard line at DA is to eat the magic soufflé immediately, I saved most of it for the next day, and I liked it even more. 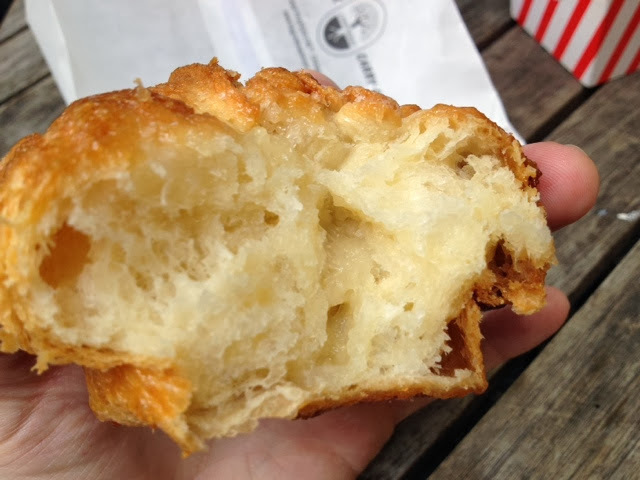 Yes, the cronut is quite tasty (see my previous thoughts here), but there is so much more to this spot than that tasty, tasty trend. 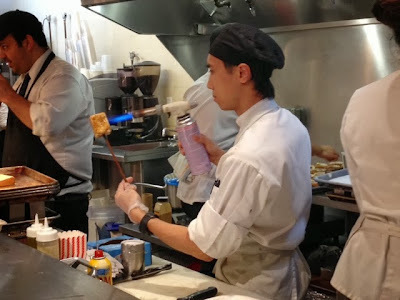 Pop on in for a bite or two and let me know what you think!! Now that it's truly starting to feel like Fall (yay! 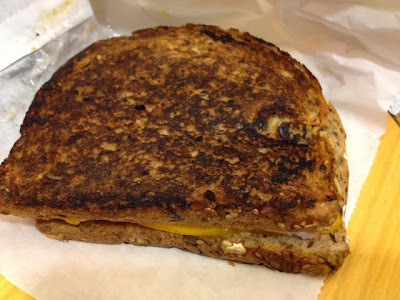 ), what could be better than a delicious grilled cheese? 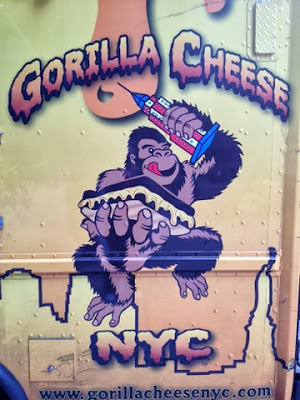 The Gorilla Cheese truck was parked outside my office recently, and I decided to try one of their gooey delicious sandwiches. 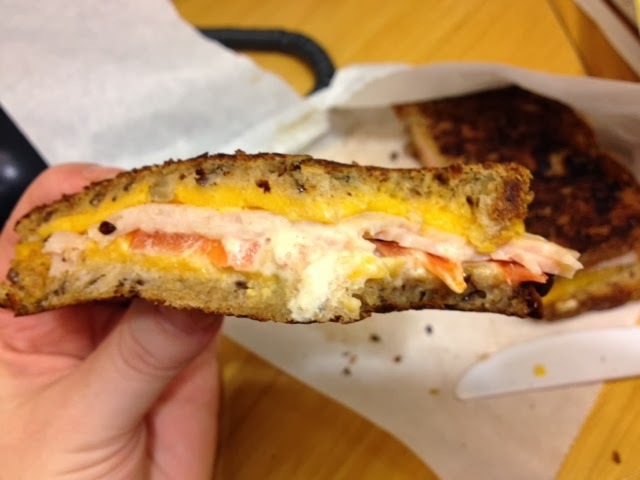 I chose the number seven: smoked turkey, cheddar, tomatoes on multigrain bread, with a chipotle aïoli for good measure! For a few extra dollars, I could make it a combo, with a drink and a side of their tater tots. Yes please! The sandwich was done perfectly: crunchy but buttery bread, warm gooey inside, and the smoked turkey went so well with everything inside that sandwich. 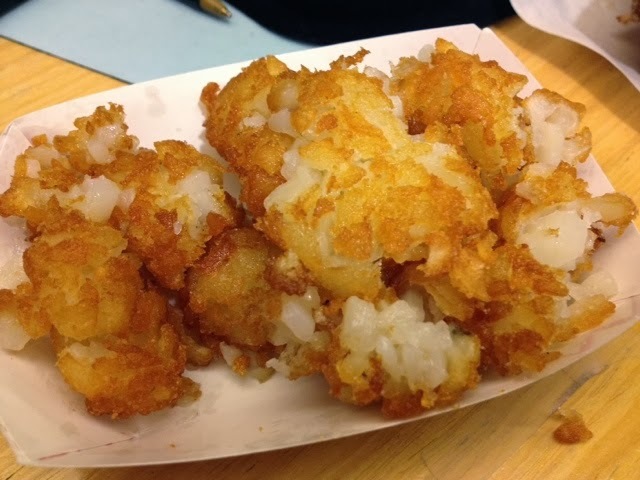 The tater tots were outrageously good – crispy on the outside, fluffy on the inside, and very salty, but I liked it that way. 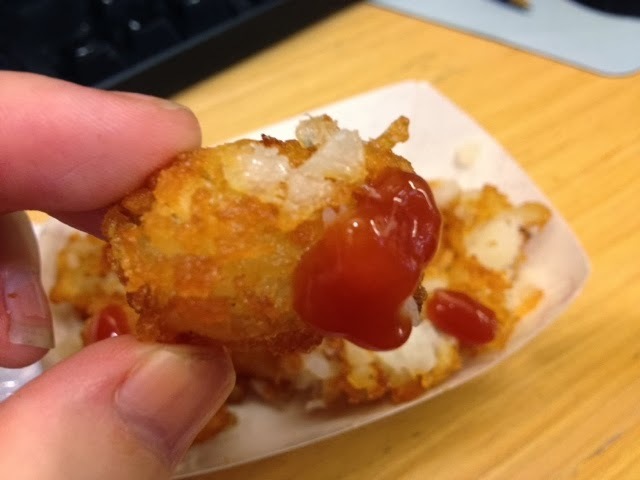 And yes, I do like to individually put ketchup each tot on its own! They have several sandwich options of different kinds of cheese, fillings, and bread. They even have sweet sandwiches, including a Smore's melt. I'll be back for that one! To find out where the gorilla cheese truck will be, follow them on Twitter @gcnyc1!